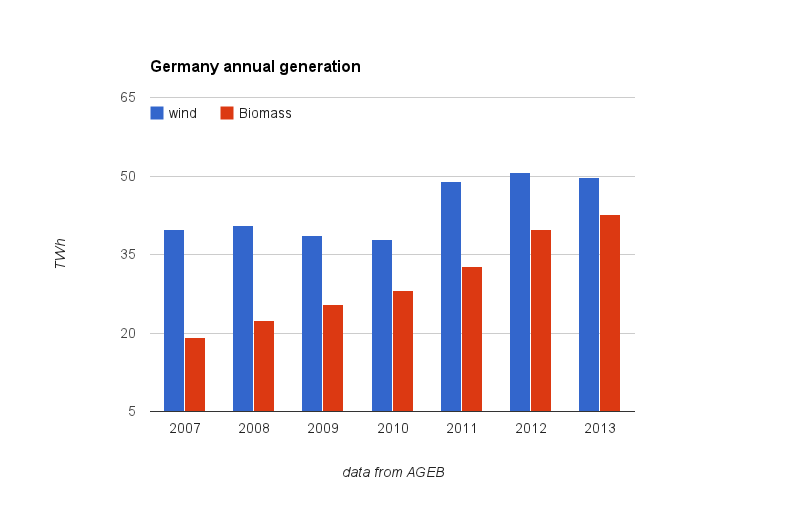 Will Boisvert's Green Energy Bust in Germany may have been the best thing written on the German energy project last year. This new article, on biomass, may be better; it's an extraordinary look at a subject that has received far too little attention. Look at the brochures of just about any environmental organization and what you will see are images of an energy system that appears to lie weightlessly on the land. Solar panels gleam atop suburban homes. Wind turbines sprout from fields where cows graze contentedly. It is a high-tech, bucolic vision that suggests a future in which humankind might finally live in harmony with nature, rather than waging ceaseless war with it. But there are other images to consider as well. Trees clear-cut, chipped, and fed into boilers. Once diverse forests turned into monocrop plantations. Wild places sent under the plow. And melting ice caps from global warming. This is the underside of renewable bioenergy — biomass, biofuels, and biogases – one that is decidedly at odds with the ethos of pristine eco-friendliness described in the brochures. On the face of it, bioenergy would seem to embody the ecological vision: an energy source rooted in the soil, attuned to the seasons, and governed by life’s cycling rhythms of growth, decay, and reuse. But today, that expression of the ecological vision is destroying nature in order to save it. From the production forests of Germany to the rainforests of Southeast Asia to the American Midwest, we are using millions of square miles of land for crops to feed our cars and power plants that could be used to feed people or become wilderness. Thank you for doing this. I have been following Ontario wind generation off and on at http://www.sygration.com/gendata/today.html. Right now it is pretty low, but the amazing thing suggested by the hourly generation data is the within day variability, how absolutely unforecastable output is from one hour to the next. If I understand correctly, the wind energy lobby wants 5-min ahead timing, instead of hour ahead for ISO-NE. I initially got interested in Ontario's generation because of the proximity of so many of its wind plants to a large water body. Now I am also struck by the large contribution of nuclear power in Ontario to serve baseload, given that New England wants to retire its aging nuclear plants. I don't think that the proponents of wind energy are aware of Ontario's generation mix or have looked at the NREL's wind map for the U.S. I came to this site because of the blog post on wind saving the day with the cold snap and natural gas supply concerns, which used your figure. I went to that post by referral from a 'progressive' site in the small coastal town of Charlestown RI where plans to site industrial wind turbines became controversial, as the Town perhaps realized that 50 dBA of wind turbine noise that they had written into their by-law would create an excessive loss of amenity for nearby homes.